Ted Leeson remains one of fly fishing's best-known lyrical essayists, and for good reason; his remarkable "The Habit of Rivers" finds its way into almost every conversation about the alltime great fly fishing books.Leeson imbues his essays with a deep sense of place and a keen sense of observation, and the only complaint I could previously muster revolved around his tendency to write too much about too little, wrapping his words into Gordian sentences that required a bit more work than was truly necessary.Inventing Montana largely escapes that trap, and in fact, I found it one of Leeson's most accessible efforts.Using an annual summer trip to the same rural cabin in Montana for a foundation, Leeson neatly wraps two decades worth of visits around an intriguing theme; his annual vacations provide only a brief glimpse of a place, and his larger "reality" is mostly a product of imagination instead of experience.His theme plays out throughout the book, but because I'm a merciful god, I've stolen several disconnected passages that nicely illustrate:Montana is not a place. It is merely the name of a place, a convenience of language, ambiguously significant. Montana does not even comprise a distinct physiographic region; it specifies only an arbitrary geopolitical construct of the type always betrayed by straight borders on a map, drawn by diplomacy or war....What is called "Montana" arises in part from our exchanges with this living space, one organism to another. Without such transactions, there is geography, but not a place....This book contains, in a sense, my own Montana, which began taking shape over two decades ago when I spent a brief few days here. They came also as an afterthought, at the end of a weeks'-long pilgrimage to the trout-fishing shrines of the West, the kind of expedition most fly anglers make at least once in their lives, partly because it gives on fishing identity a certain credibility, and partly because it would be a shame to die without having a look at some of the loveliest rivers on the continent.Leeson fills Inventing Montana with keen observation, crafting a rich landscape and populating it with interesting people (including his own party).Simply put, Inventing Montana is far more than a collection of essays about fly fishing a particular spot on the planet, and like most of Leeson's work, it's filled with insightful - and often hilarious - gems like:"the region is to fly fishing what the Golden Crescent is to opium production, and does a similarly brisk business. "Leeson's prose deftly carries us along on trips gone wrong (and right), and richly describes encounters (including repeated visits from a twitchy landowner trying to deprive his party of legal access to a stream) that paint a compelling - and wholly engrossing - picture.While the book constructs a fascinating image of a place, Leeson's insights aren't always of the dreamy variety; this McGuane-esque passage hits hard and strikes a resonant chord:Aside from the fish, who undoubtedly have their own opinion on the matter, and regardless of whatever it may have been in the more distant past, fishing is now at heart a form of play. I have always assumed this much to be obvious, but judging from the current trajectory of the sport, evidently it is not. Modern angling is uncomfortable with the idea and prefers to regard itself more along the lines of modern medicine, as an acutely specialized body of knowledge dispensed by a priesthood of experts. It tends to operate in the oxygen-depleted atmosphere of high gravitas or, more recently, in the overstimulated public displays of cultivated fanaticism. Those deficient in the requisite intensity - who fail to mount a sufficiently strategic angling campaign, do not whoop in ecstatic wargasm as the battle rages or pump the air with a victory fist at the climactic moment of conquest - are left to marinate in the unpleasant secretions of their own inadequacy. 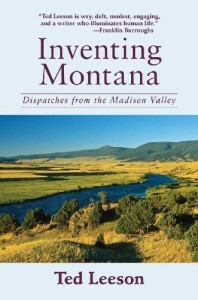 "At the very least, Inventing Montana is a pleasant summer read; a series of stories (masterfully told) about one man's repeated visits to a place many of us have seen and fished.Few will be able to resist the temptation to measure their own perceptions against Leeson's, but on a more compelling level, Inventing Montana attempts to understand the nature of fly fishing's hold over us.No one could ever truly plumb the breadth (or perhaps the depths) of the fly fishing addiction, but Leeson - using one small place as a representative piece of a larger puzzle - crafts a narrative so interesting, I don't care if any questions are ultimately answered.Inventing Montana a great ride - one you won't want to end.